Posted on October 28, 2017 by Sophie W.
This is my favorite book of all time. It is about a girl named Skylar Evans who lives in the trailer park with her alcoholic mom and Josh Mitchell, a Marine come back from the war without a leg and demons in his head. Personally, I had never read a book before I’ll Meet You There that made me feel so many emotions. I was torn apart by these beautiful characters as they struggle to find peace in their lives and find hope in one another. I cried, laughed, and screamed. The immense emotions I felt made me read this book again, and then again. And again. If I could I would make everyone read this book. I received an insight into the mind of someone with PTSD. The short passages from Josh’s perspective made this book worth wild. I believed that I was there right next to Josh, watching the war around him tear men, who had become his friends, apart. I cried more than I expected at the end of this novel. Sure, a happy or sad ending can be a tear jerker, but Demetrios wrote this young adult novel with a purpose, and boy did she achieve it. I see that there is still a battle to be fought against ableism when Josh is uncomfortable by the “special” treatment he receives for his injury. I see through Skylar’s eyes the poverty that has overtaken this country and makes it almost impossible for her to achieve her dream. Overall, please read this book. It has an amazing, fun plot with serious underlying themes. Read I’ll Meet You There by Heather Demetrios! 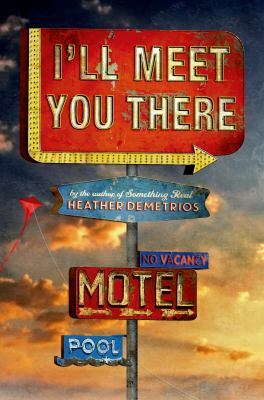 I’ll Meet You There by Heather Demetrios is available for checkout from the Mission Viejo Library. This entry was posted in Book Reviews and tagged friendship, high school, teens, veterans, war by Sophie W.. Bookmark the permalink. Wow this sounds very interesting! I can’t wait to read it! This actually looks really good! Great review.